These shoots are a fun and exciting events, orchestrated in a way to truly show the couple’s relationship. 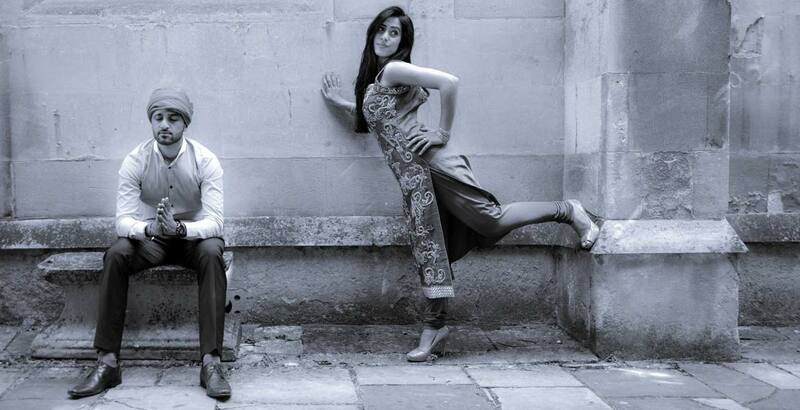 The pre wedding gallery further illustrates this and as you can see there is lots of energy in these photographs. We have done lots of pre wedding photography and our approach is focused around the relationship between the couples’ and do not see doing our photography of one where the couple is walking hand in hand in a park. In recent times we have started doing more and more casual engagement videos using different formats, for example a couple on a bus or a street with the filming being done in a quick paced guerrilla action. Our engagement photography (not to be confused with asian wedding ring ceremony or other formal engagement ceremonies) are fun filled events and last for most of the day. What you wear on your wedding day that is a wedding dress. However for the pre wedding photo shoots we always suggest some bright contrasting colours that you are comfortable wearing. This helps to bring you out from dreary backgrounds, for example wearing black and standing next to ornamental gates which are painted black and gold will not do you any justice, you will just blend into the gates. It is surprising how many people turn up to the shoot wearing dark clothing on a dark cloudy day. We are also asked how one should pose for the photographs. This is a good question and one, which is the hardest to answer. The simple answer is that we cannot teach you how to pose, all we can do is direct you in terms of how you could improve your stance or position. What we advise people is that they should practice at home in front of a mirror and also try to reflect on what type of character they want to be, which could be someone from a novel, which they have read or a film they have watched. This would be the basis of you getting your mind to look at you in a way that you want to be seen and this will naturally manifest itself out on the day of the shoot in front of the camera. We are quite experienced in this field and most of our wedding packages include a pre wedding shoot, which we thoroughly discuss these with you at the initial stages. We have found that this helps tremendously towards the wedding day, where we see the couple truly become comfortable in front of the camera and are keen to have their photographs taken. In addition to this we are also able to offer engagement video shoots in a format of your choice. Most couples prefer to do this in a music video format with the video being played at the wedding reception, which goes down extremely well with the wedding guests.